Fixes for the “Could not connect to an ANT+ USB Stick.” error. 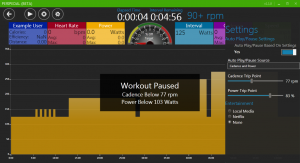 “Workout Paused” overlay added when workout is paused. Auto Play/Pause expanded to support speed and/or power. Trip points are now user-adjustable. Hopefully this update will take care of the ANT+ USB stick error some users have been experiencing. This update also expands on the auto play/pause feature allowing the user to specify whether auto play/pause should be determined by speed, cadence, or both. The trip points are user-adjustable allowing you to set them as you see fit. In the image below you can see the Auto Play/Pause settings and the new Workout Paused overlay. 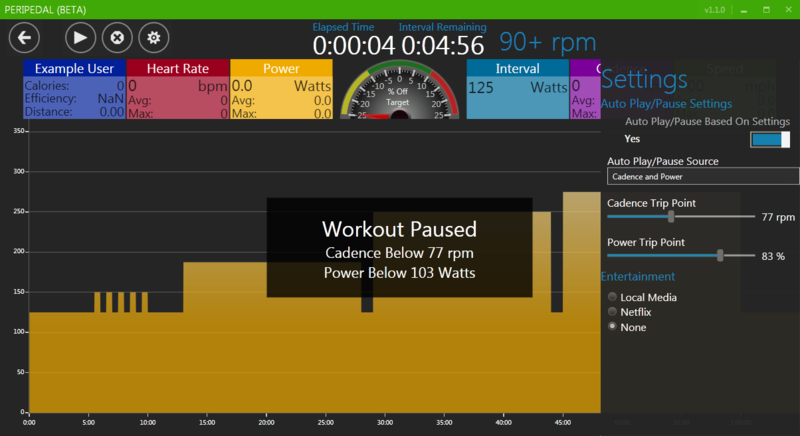 As seen in the screen shot if Auto Play/Pause is enabled the Workout Paused overlay will also tell you what is causing the workout to be paused. Thank you for all of the feedback received so far and please keep it up! If you have any issues please e-mail support@peripedal.com.